While some people may not consider this a holiday dish, I first remember seeing it in the December issue of Southern Living 2003.This recipe has always been a favorite of mine and something that I wanted to serve at my Crescent party but I ran out of time! This would be something great to make with leftover Christmas candy. I remember making them one time for a Valentine's Day treat! Unroll crescent dough and separate each dough portion along center and diagonal perforations, forming 8 triangles. Place 2 chocolates, points up, on wide end of each triangle; place a third chocolate between the 2 chocolates, point down. 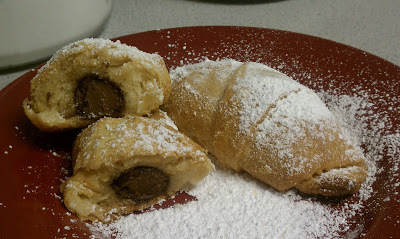 Starting at wide end of triangle, roll dough over chocolates, pinching edges to seal. Place rolls, sealed sides down, on an ungreased baking sheet. Shape into crescents. Bake at 375° for 10 minutes or until lightly browned. Serve crescents warm after cooling for about 3-5 minutes. Dust with powdered sugar.